LeBron James' NBA will always be compared to that of Michael Jordan, with some saying he's supplanted MJ as the greatest player that ever lived, and others saying the total opposite. That debate will rage on until the next guy supplants James. But we can at least say they are on the same incredibly high level, and now they're equals in a totally different way as both will have starred in a Space Jam flick. 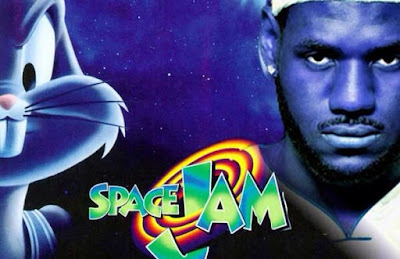 For years there have been rumors that James would star in a sequel to Space Jam, the 1996 film that starred Jordan and a bunch of Looney Tunes characters. Back in 2014 it didn't appear the project was going forward, but now it definitely is with Justin Lin (Fast & Furious franchise) directing and Andrew Hodge (Bad Words) writing the script. There aren't any other details, but isn't it enough that James will probably be sharing an intergalactic b-ball court with the Tasmanian Devil and Daffy Duck?